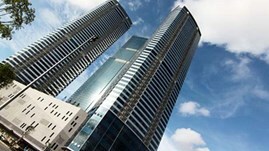 Construction firm Keangnam Enterprises Inc. of the Republic of Korea (RoK) has been given the green light by the Seoul Central District Court on May 27 to sell a skyscraper in Hanoi in a bid to handle its liquidity crisis, Yonhap news agency reported. At the request of an independent agency appointed to take charge of Keangnam case, the court has allowed the selling of the 72-storey Hanoi Landmark Tower, owned by the firm’s subsidiary, Keangnam Vina, which is currently under a debt workout program. The court said the decision is crucial to protect the benefits of Keangnam’s creditors. In the last two years, given a downturn in the domestic real estate market, the business faced continuous loses. It has borrowed approximately US$2 billion but failed to repay. The company on March 27 filed for corporate rehabilitation and since April 7 the court has been conducting a review of the company’s books, debts and assets both inside and outside the country. Whether the Hanoi skyscraper, one of the company’s largest assets overseas, will be sold or not will decide the final success of Keangnam Enterprises’ rehabilitation plan, declared the court.